The 284th Rifle Division began service as a standard Red Army rifle division shortly after the German invasion. Moved to the front soon after, it helped defend the Soviet lines west of the Ukrainian capital for more than a month, but was then destroyed in the encirclement of Kiev. 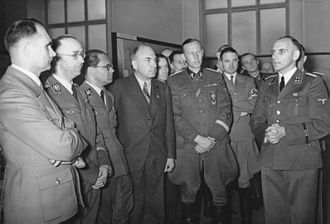 A new division was formed in early 1942. It served in the early fighting against the German summer offensive of 1942 until its losses forced it to be withdrawn for rebuilding. 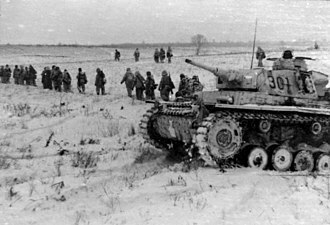 In September it was redeployed, and played a leading role in defending the northern part of the central city and Mamayev Kurgan hill in the Battle of Stalingrad, and later in the reduction of the trapped German 6th Army during Operation Ring, for which it was raised to Guards status as the 79th Guards Rifle Division shortly after the battle ended. A third 284th was raised a few months later. It served on the quiet fronts of the Far East for most of the rest of the war before fighting briefly against the Japanese in Manchuria in August, 1945. The unit continued to serve well into the postwar period under other designations. Just three weeks after forming the 284th was railed to the Kiev Defense Sector. By August 12 it was assigned to 37th Army of Southwestern Front, and helped to defend the direct approaches to Kiev for the next month, but this left it hopelessly trapped when the German forces linked up far east of Kiev in September. 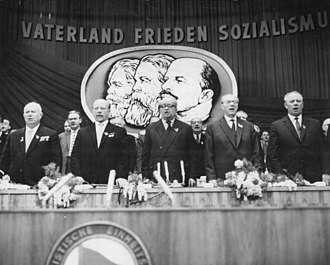 The division was effectively destroyed later that month, although it was not officially removed from the Soviet order of battle until December 27. On December 15 a new rifle division, the 443rd, began forming at Tomsk in the Siberian Military District. Kombrig Sergei Aleksandrovich Ostroumov was given command on that date. On January 27, 1942 it was re-designated as the new 284th Rifle Division. With most of its personnel of Siberian origin, it became known unofficially as the “Tomsk” division, although there were also large numbers of men from Novosibirsk and Kemerovo as well. Its order of battle remained the same as the 1st Formation. The unit spent about three months in training in Siberia before being sent to the front. On February 27, Col. Nikolai Filippovich Batyuk took command, which he would hold for the remainder of the 2nd Formation. The division was assigned to the new 48th Army in Bryansk Front. When Operation Blue began on June 28 it had not yet arrived in that Army, and was under direct command of the Front. 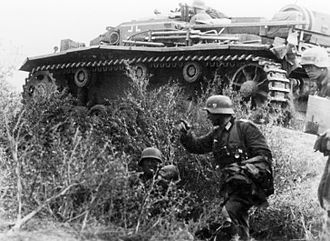 In the first two days of the offensive a gap about 40km wide and 35-40km deep was torn in the Front's defenses by the 4th Panzer Army. As a fresh unit, the 284th was ordered into the gap, along with the 1st Destroyer (Antitank) Division, to set up an all-around defense at Kastornoye. By June 30 the two divisions were defending the town with "exceptional stubbornness". 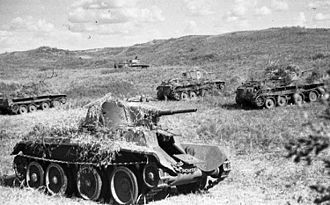 On July 3 they came under further attack from 9th Panzer Division, which elected to bypass to the south of the position, forcing the Soviet units to withdraw northeastwards to avoid encirclement. However, even with more antitank assets on hand than usual, the 284th took considerable losses during its retreat. By July 14 it regained the Soviet lines northwest of Voronezh. Within days it was subordinated to Operational Group Chibisov, which was formed from assets of Bryansk Front under command of the Front's deputy commander, Maj. Gen. Nikandr Evlampievich Chibisov. The plan was for this Group to attack the German 2nd Army in a salient west of Voronezh. It was intended to begin on July 17 but in the event was put back to the 21st. In the division there are 3,172 military servicemen; a batch of replacements numbering 1,312 men has arrived and another 2,000... are expected, but in the division there are only a total of 1,921 rifles, 98 [semi-]automatic rifles and 202 PPSh submachine guns... There are 21 motorized vehicles in the division, but according to the shtat [Table of Organization and Equipment] there should be 114. There are just 7 heavy machine guns, but according to the shtat 108 are necessary. 47 light machine guns, but according to the shtat there should be 350. 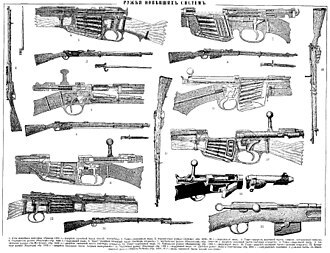 36 anti-tank rifles, but 277 according to the shtat. The division's separation from its supply base extends up to 100 kilometres and aggravates the supply [of] food. "At 0800 the 237th Rifle Division, without offering any resistance [underlined in original text], was fleeing in the direction of Kamenka, completely exposing the left flank and rear of the 284th... and made no attempts to regain its lines or to render fire support. The units of the 284th... were continuing to hold their occupied line... Only by 1400 was the left flank pushed back to a line along the southwestern outskirts of Ozerki under the onslaught of a large number of enemy tanks and enemy motorized infantry... The 1045th Rifle Regiment... by the end of the day fell back to [this] line. Batyuk reported losses of 20 men killed, more than 150 wounded, and 16 missing in action, plus three guns damaged and under repair. He also reported around 14 knocked-out or burned-out German tanks in front of his positions. Just after midnight on July 25 Batyuk was ordered to go on the attack once again at 0500, but this effort again made little impression. The division tried again on the 26th, and gained a little ground towards Spasskoe before being forced back to its start line. This was its last attempt; the division's ranks were extremely thin, although morale remained strong. On July 29 the offensive ended, and within days the 284th was pulled from the line, arriving in Sverdlovsk in early August for rebuilding. A large number of the needed replacements were recruited locally, but the division also received several thousand sailors from the Pacific Fleet. On August 31 the restored division was in 4th Reserve Army, located 250-350km northwest of Stalingrad. Less than ten days earlier, the first forces of German 6th Army had reached the Volga River north of the city. On September 17 the division was assigned to 62nd Army and began arriving on the east bank, its first elements crossing the Volga in the early morning of the 21st. The 284th's initial assignment would be to fill the gap between the 95th Rifle Division, which had begun crossing the day before and was responsible for the defense of Mamayev Kurgan, and the 13th Guards Rifle Division, which had been desperately defending the city center over the past few days. Although the division was back up to a strength of about 10,000 men, it was still lacking weapons, and on arrival only the 1043rd Rifle Regiment was completely equipped, so it was the first to cross. It was briefly held in reserve, before moving forward to relieve the exhausted troops of the 112th Rifle Division from Mamayev Kurgan to the Krutoi Ravine. On September 22, two regiments of the German 295th Infantry Division pierced the defenses of the 112th and reached the west bank of the Volga at several points "after difficult fighting." Later in the day the now-armed 1047th and 1045th Rifle Regiments arrived in time to drive back these tenuous footholds. It was the intention of Lt. Gen. Vasili Ivanovich Chuikov, commander of 62nd Army, to counterattack the German positions with his newly-arrived forces, but these efforts came to very little. By the end of the day on September 25, the 284th reported a total strength of 7,648 men. It was deployed as follows: "1047th Rifle Regiment is along the northern bank of the Krutoi Ravine, with its right flank anchored on the line of the railroad to Artemovskaia Street. 1043rd Rifle Regiment is fighting along the (incl.) Artemovskaia Street line, with its left flank at the line of the railroad to the northern bank of the ravine (east of Nekrasovskaia Street). The 1045th Rifle Regiment is in the army's reserve." The division would remain in this general area, between the central city core and the main factory district, for the remainder of the battle. 6th Army renewed its offensive on September 27, now driving on the factory district, but also attempting to clear Mamayev Kurgan on the way. 95th Rifle Division was badly hit by the relatively fresh 100th Jäger Division and lost most of the hill. Meanwhile, the 100th Jäger's 369th Croatian Regiment joined with the 516th Regiment of the 295th Division to assault the defenses of the 1045th Regiment southeast of the hill, penetrate into the "Tennis Racquet" region and seize the Meat Combine (abattoir). The remaining regiments of the 295th were to attack eastwards along the Dolgii and Krutoi Ravines, crush the 1043rd and 1047th Regiments, and reach the Volga, cutting 62nd Army in half. Stiff and often fanatical resistance by all three regiments stopped these drives well short of their goals. The division lost about 300 men killed or wounded during the day. The 95th Rifle Division, supported by two battalions of the 1045th Regiment and massive air strikes by 8th Air Army, counterattacked Mamayev Kurgan on September 29 and retook the survey marker near the crest, although they were stopped short of the water tank at the very top. Apart from this, the rest of the division was deployed abreast from north to south, defending a strip of land from the south slope of the Kurgan to its left boundary with 13th Guards. This all came at a cost, and by the evening of October 1 the 284th was reduced to a strength of 3,496 men. On October 3 a renewed attack by the 295th Infantry drove the forces of the 95th and 284th off the north slope of the hill and back through the Military Clothing Factory to positions on the south bank of the Bannyi Ravine. However, similar attacks against the main positions of the division made no progress; the 295th had also taken many losses. 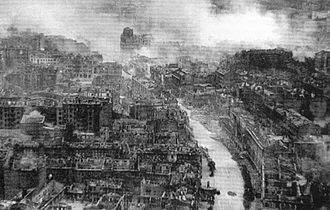 For several days a lull in the fighting set in, and on October 9 the 284th was ordered to occupy the sector held by two regiments of the 95th so they could be redeployed to the factory district. During this time the division received replacements and men returned from hospitals and aid stations, and on October 10 reported a strength of 5,907 men, making it the second-strongest division in 62nd Army after 13th Guards, which was being replenished by the same means. "At the end of the day, we were told that the command post of the 1045th Regiment had been destroyed by a direct hit from a bomb. The Commander of the regiment, Lieutenant Colonel Timoshin, had been killed." An advance by the 14th Panzer Division in the Khvost Ravine south of the Barrikady on October 27 threatened the ferry landing where the 45th Rifle Division was crossing the Volga. Chuikov had to build a counterattack force from staff and rear services, 30 men recently discharged from aid stations, and three patched-up tanks to retake lost ground. Meanwhile, the 6th Company of 1045th Regiment reinforced the defenses of the 193rd Rifle Division's 895th Regiment along Dolinskaya and Umanskaia Streets. On November 1 the main body of the 284th continued to hold its primary position, a front 3,600 metres wide and from 100 - 800 metres deep, the deepest frontage now that the 6th Army held 90 percent of the city. Since this sector was not under German attack in November, the division contributed with assault groups which attacked enemy pillboxes and dugouts, especially at night. It also repulsed an attack up the Bannyi Ravine by a company of enemy infantry on November 10. On the same day, two battalions of the 92nd Rifle Brigade crossed the Volga into the 284th's sector to join the 1043rd Regiment in second echelon; Chuikov feared a major German attack on the Chemical Factory, which never occurred. In the following days German 6th Army made what turned out to be its final bid for the factory district. The Krasnyi Oktiabr plant was mostly in German hands, and Batyuk was ordered "to allocate part of its 1043rd Regiment to relieve the left wing battalion of 112th [Guards] Regiment (39th Guards Rifle Division) on the night of November 12-13 and prepare its sector for a firm defense." By the end of the 13th, the division probably had no more than 1,200 men remaining on the west bank, although the official total reported by 62nd Army on November 20 was 4,696. That last date is significant, as the day previous the Soviet forces outside the city began Operation Uranus. Chuikov was under orders to continue to take the fight to the enemy so as to assist the counterattacking forces outside. On November 21, the 1047th and 1045th Regiments, supported by part of the 92nd Rifle Brigade, launched an attack at 1400 which retook the crest of Mamayev Kurgan from 100th Jäger Division. Further attacks on the next day again failed to take the water tank. On the 23rd the assault on the hill made only minor gains, as did an attack towards the Krasnyi Oktiabr. After a break of 24 hours, the best the division could do on the Kurgan was to improve its positions slightly. On November 29 the 284th lost 105 men killed or wounded in similar efforts; furthermore the 62nd Army was suffering severe shortages of supplies due to the partly-frozen Volga, and on the 30th it was finally ordered to go over to the defense. Further attacks on the hill took place on December 3. On that day, 295th Infantry Division reported 78 casualties, but the 284th made no significant gains in territory and was now down to an estimated strength of 1,500 men. The fighting was halted once again until December 14, when the division struck again, this time at 100th Jäger, with similar results. On the 28th a larger effort was ordered, involving the 45th Rifle, 39th Guards Rifle, and 284th Rifle Divisions, plus 92nd Rifle Brigade, to drive the Germans off the hill and away from the Krasnyi Oktiabr and the southern half of its workers' settlement area. This failed to reach its goals, but made gains against a weakened enemy. During the first ten days of January, 1943, the 284th, along with the divisions and brigade above, and later joined by 95th Rifle Division, made preparations for Operation Ring, the reduction of the German pocket. This involved reconnaissance, seizing and holding individual buildings, and destroying enemy firing points and bunkers. Also during this period Chuikov redeployed the 348th MG-Artillery Battalion of the 156th Fortified Region into the city along the Dolgii Ravine between the 284th and 13th Guards; this allowed Batyuk's troops to consolidate on a shorter line. When Ring began on January 10 the division's specific mission was to attack with all three rifle regiments abreast to take Mamayev Kurgan and destroy the enemy units there. In the event, although the water tank was finally taken, the desperate German defenses held. Over the next few days, further transfers from 156th Fortified Region allowed 13th Guards to redeploy northwards onto the right flank of the 284th. By nightfall on January 17, additional gains had expanded the area of 62nd Army's bridgehead in the city by about 50 percent. A lull set in over the next few days, but on January 22 Chuikov ordered his men back to the attack, but again only limited gains were made. The final act began on January 26, when Don Front renewed its offensive along its entire line. The 284th and 13th Guards were carefully briefed with recognition signals and radio call signs to secure a smooth link-up with 21st Army, which came at 1100 on the 284th's sector. The German pocket was now cut in two, and the division was assigned to help reduce the south pocket. Attacking alongside the 52nd Guards Rifle Division of 21st Army on the 28th the men of the 284th drove their old foes of the 295th and 100th Jäger Divisions back to the southern bank of Dolgii Ravine. On January 30 the division, now together with 173rd Rifle Division, pressed southward towards the northern part of the city's center. An advance of more than a kilometre broke the back of the 295th's defenses and penetrated to the northern edge of 9th January Square and the western end of Solnechnaia Street. On the 31st the 284th captured the square and linked up with troops of 64th Army. 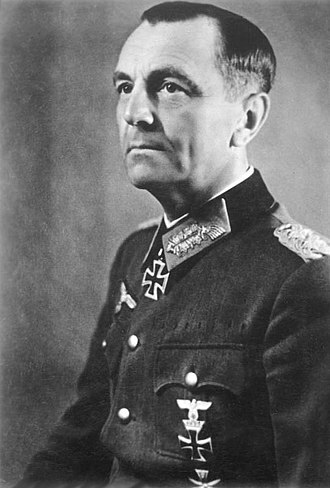 On the same day, Field Marshal Friedrich Paulus surrendered his 6th Army, but the north pocket continued to hold out. Showing remarkable stamina, the division rejoined 62nd Army to join its attack there on February 1. It teamed up with 45th Rifle Division and the 34th Guards Regiment of 13th Guards, and was reinforced with engineer tanks and an antitank regiment, with the objective to seize the worker's village of the Barrikady factory, and then into the rear of Bread Factory No. 2. As so often before, the gains made that day were minimal, but it made little difference as the German forces in the pocket laid down their arms on the morning of February 2. While most of the divisions of 62nd Army were transferred in the next few weeks, the 284th (soon redesignated 79th Guards Rifle Division) would remain in 62nd Army (soon redesignated 8th Guards Army) for the duration of the war and into the postwar era. "To be honest, most of the divisional commanders didn't really want to die in Stalingrad. The second something went wrong, they'd start saying: 'Permit me to cross the Volga.' I would yell 'I'm still here'... [But] Batyuk and Sokolov [45th Rifle Division] behaved wonderfully... I very rarely had to [speak sharply] with Rodimtsev, Batyuk, and Guryev [39th Guards Rifle Division]. Following the surrender of 6th Army, on February 8 the division was awarded the Order of the Red Banner for "exemplary fulfillment of command tasks" and its "valor and courage". On March 1, in further recognition of the division's prowess both on the defense and during the offensive that crushed the trapped German force, it was redesignated as the 79th Guards Rifle Division. The final 284th Rifle Division was one of six new divisions formed in the Transbaikal in July, 1943. Its order of battle remained the same as the first two formations. Col. Vasilii Stepanovich Elikhov was assigned to command on July 15. It served in the Transbaikal Front, in 17th Army, for the duration. Colonel Elikhov was replaced by Col. Aslan Usupovich Badzhelidze on April 21, 1945. When the Soviet Union declared war on Japan on August 9, 1945, the division joined in the advance into Manchuria. This advance was mostly unopposed, and this formation of the 284th saw very little, if any, combat. For its efforts, the division was awarded the honorific Khingan. In October, 1945, the division became the 14th Mechanized Division at Nerchinsk, part of the 6th Guards Tank Army. On June 4, 1957, it was redesignated as the 89th Motor Rifle Division. 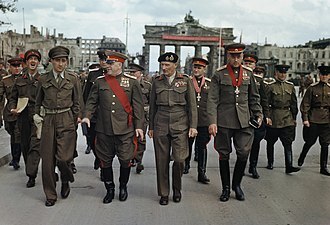 Colonel Batyuk, Senior Sergeant Zaitsev, and several other men of the 284th appear briefly (Part One, Chapter 55) in Vasily Grossman's novel Life and Fate. Grossman had actually interviewed both Batyuk and Zaitsev during the Battle of Stalingrad. Viktor Nekrasov's novel Front-Line Stalingrad (Harvill Press, 1962) is based on his experiences fighting as a junior officer in the 284th at Stalingrad. William Craig's history of the Battle of Stalingrad, Enemy at the Gates: The battle for Stalingrad was published by Penguin Books in 1973. It was one of the first mass-market books in the English language to give details of the Battle of Stalingrad, including some history of the 284th. David L. Robbins' novel, War of the Rats, (Bantam Books, New York, 1999) is a fictionalized account of Vasili Zaitsev's experiences in the Battle of Stalingrad, including his possible battle with a German sniper, Major Erwin König. The 2001 film, Enemy at the Gates, is mostly based on Robbins' novel. ^ Walter S. Dunn, Jr., Stalin's Keys to Victory, Stackpole Books, Mechanicsburg, PA, 2006, p. 77. ^ Goff 1998, pp. 197, 199. ^ Affairs Directorate of the Ministry of Defense of the Soviet Union 1967, p. 130. ^ Feskov et al 2013, p. 485. ^ Feskov et al 2013, p. 204. Affairs Directorate of the Ministry of Defense of the Soviet Union (1967). 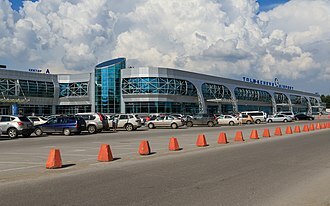 Сборник приказов РВСР, РВС СССР, НКО и Указов Президиума Верховного Совета СССР о награждении орденами СССР частей, соединениий и учреждений ВС СССР. Часть I. 1920 - 1944 гг [Collection of orders of the RVSR, RVS USSR and NKO on awarding orders to units, formations and establishments of the Armed Forces of the USSR. Part I. 1920–1944] (PDF) (in Russian). Moscow. At the 2010 Census, it had a population of 1,349,772. 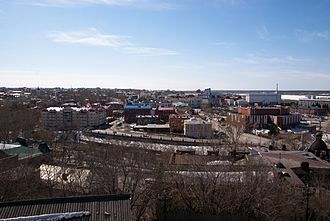 Yekaterinburg is the industrial and cultural centre of the Ural Federal District. 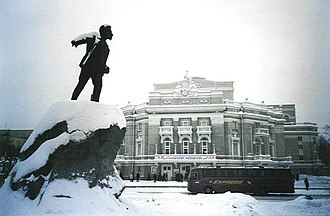 Between 1924 and 1991, the city was named Sverdlovsk after the Communist party leader Yakov Sverdlov, Vasily Tatishchev and Georg Wilhelm de Gennin founded Yekaterinburg in 1723 and named it after the wife of Tsar Peter the Great, who became empress regnant Catherine I. The official date of the foundation is November 18,1723. 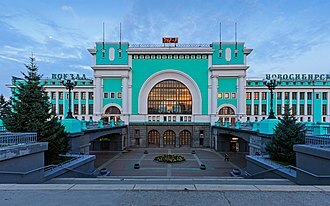 It was granted town status in 1796, the city was one of Russias first industrial cities, prompted at the start of the eighteenth century by decrees from the Tsar requiring the development in Yekaterinburg of metal-working businesses. The city was built, with use of iron, to a regular square plan with iron works. 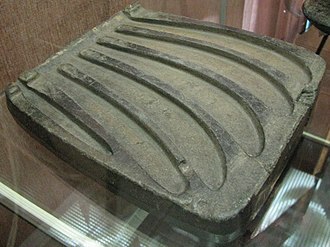 These were surrounded by fortified walls, so that Yekaterinburg was at the time both a manufacturing centre and a fortress at the frontier between Europe and Asia. It therefore found itself at the heart of Russias strategy for development of the entire Ural region. With the growth in trade and the administrative importance, the ironworks became less critical. 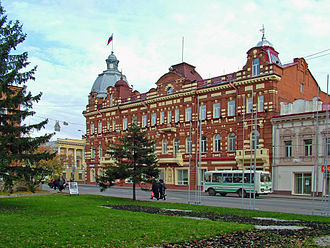 Small manufacturing and trading businesses proliferated, following the October Revolution, the family of deposed Tsar Nicholas II were sent to internal exile in Yekaterinburg where they were imprisoned in the Ipatiev House in the city. Other members of the Romanov family were killed at Alapayevsk the same day, on July 16,1918, the Czechoslovak legions were closing on Yekaterinburg. The Bolsheviks executed the deposed imperial family, believing that the Czechoslovaks were on a mission to rescue them, the Legions arrived less than a week and captured the city. 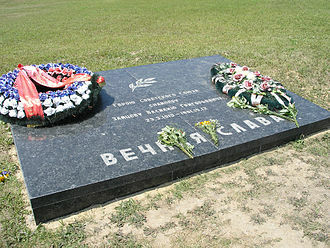 In 1977, the Ipatiev House was demolished by order of Boris Yeltsin, Yeltsin became the first President of Russia and represented the people at the funeral of the former Tsar in 1998. 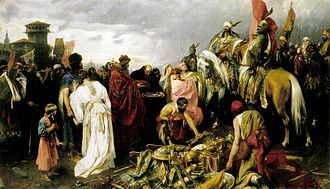 On August 24,2007, the BBC reported that Russian archaeologists had found the remains of two children of Russias last Tsar, the discoveries in 2007 are thought to be those of Tsarevich Alexei and Grand Duchess Maria. The 13th Guards Rifle Division was a Soviet Union Red Army infantry division that served with distinction during the Second World War. The 13th Guards Rifle Division was formed on 19 January 1942, the 87th Rifle Division itself had seen action fighting against the Second Polish Republic in the Nazi-Soviet invasion of Poland in 1939. Later that year, the division was sent northwards to Finland to serve as reinforcements in the Winter War against the Finnish defences, as the division was transferred to the Finnish Front, it escaped the fate of many Red Army units during the conflict. 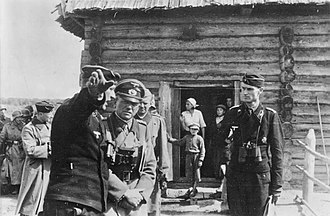 After the Soviets conquered the areas demanded from Finland, the unit was transferred to Soviet Ukraine in early 1940, on 22 June 1941, the German Wehrmacht launched Operation Barbarossa against the Soviet Union from the German–Soviet frontier in occupied Poland. During the opening hours of the German offensive, the 87th Rifle Division, a part of the 5th Army, at least a portion of the division was encircled during the opening day of the war. Their involvement in heavy fighting seems to have continued as their recently appointed commander, three months later, in the fighting that ended with the encirclement of Kiev, the 87th Rifle Division was still a component of the 5th Army. Amongst the survivors of the encirclement of Kiev was Colonel Alexander Rodimtsev, the commander of the 5th Army Brigade, on 6 November, the 87th Rifle Division was re-formed around the survivors of the 3rd Airborne corps and placed under the command of Col. Rodimtsev. On 19 January 1942, the 87th Rifle was officially awarded Guards status and was re-designated as the 13th Guards, during this offensive, the division suffered more than fifty-percent casualties, most of which were sustained in the repelling of fierce German counter-attacks. It was during one of these attacks that an Artillery Captain of the 13th earned the first Order of the Great Patriotic War 1st Class to be awarded, following his units success during this offensive, Colonel Rodimtsev was subsequently promoted to Major General. After the Kharkov operation, the 13th Guards were pulled from the line to be refitted, resupplied, by the end of the day the German 71st Infantry Division had reached the city center, north of the Tsaritsa Gorge. A Stavka directive ordered the 13th Guards Division to the Volga River, due to being in the midst of re-fit and resupply, one thousand of the divisions men were unarmed, and nearly all of the rest were short of ammunition. After being briefed by Lieutenant General Vasily Chuikov, the commander of the 62nd Army, on his assignment, Rodimtsev famously and determinedly declared, I have no intention of abandoning the city. Immediately, Chuikov decided to send this poorly armed yet determined unit straight into the midst of the battle, Major General Rodimtsev thanks to his experience fighting in the Spanish Civil War was well versed in urban warfare. At 17.00,14 September, the elements of the 13th Guards swiftly crossed the river to reinforce a line that was being held by a mere 15 tanks. A fortified district or fortified region in the military terminology of the Soviet Union, is a territory within which a complex system of defense fortifications was engineered. Each fortified district consisted of a number of concrete bunkers armed with machineguns, antitank guns. The bunkers were built in groups for support, each group forming a centre of resistance. The area in between was filled with barriers and obstacles, as well as mine fields. A dedicated military unit was assigned to man each region. The concept of ukrepraions was developed during the Russian Civil War, the first military units named so appeared in 1923. In 1928 the program for the construction of the system of fortified districts was launched. It started with 13 fortified districts, which over the time have evolved into the Stalin Line. Beginning in early 1942, long after the lines in the west had fallen. These were brigade-sized in terms of manpower, with anywhere between four to eight machine gun - artillery battalions, a company, a medium mortar company. The 193rd Tank Division was originally a Red Army infantry division that was reorganised after World War II as a mechanised and a tank division of the Soviet Army. The original 193rd Rifle Division was established in the Kharkov Military District on March 14,1941. K, joined with the 195th and 200th Rifle Divisions to form the 31st Rifle Corps. On June 28 the Corps was assigned to 5th Army and the 193rd went into battle at Rozhits, by July 8 it was down to 3,500 men and less than 35 guns and mortars of all types. In September the 193rd was surrounded with 5th Army in the Kiev Pocket, the divisions number was officially stricken from the Soviet order of battle on Dec.27. The division was reformed at Sorochinsk, in the South Urals Military District and it comprised, 685th Rifle Regiment 883rd Rifle Regiment 895th Rifle Regiment 384th Artillery Regiment 50th Antitank Battalion 4th Sapper Battalion 320th Reconnaissance Company. 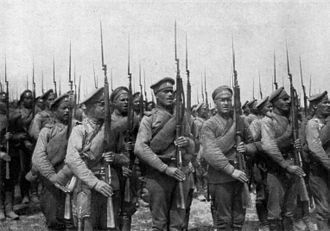 In June the division went to the Voronezh Front reserves, but was far from complete at that time. On 17 September the division, commanded by Col. F. N. Smekhotvorov, was assigned to the 62nd Army and fought during the Battle of Stalingrad. On 22 Sept. the 685th Regiment was ferried from the east to the west bank of the Volga into central Stalingrad and five nights later, on the 27th, the 883rd and 895th were deployed in the Red October factory complex. The following day, the 883rd was attacked by German tanks, anti-tank rifleman Mikhail Panikakha was attempting to defend his position with Molotov cocktails. A German bullet ignited one of his bombs, setting him alight and he threw himself against a tank with his remaining bomb and destroyed it, at the cost of his own life. Panikakha was posthumously made a Hero of the Soviet Union in 1990, the division was mauled and pushed back in a fierce German attack on 1 Oct. A day later, it was defending the western part of the Red October Factory, which included the kitchens, the regiments, down to 200 men, were unequal to the task and were pushed back by German tanks and infantry. A table of organization and equipment is a document published by the U. S. Department of Defense which prescribes the organization and equipage of units. Also used in acronyms as T/O and T/E and it provides information on the mission and capabilities of a unit as well as the units current status. A general TOE is applicable to a type of rather than a specific unit. In this way, all units of the same branch follow the structural guidelines. In the U. S. Army, there are four types of TOEs, The Base Table of Organization and Equipment An organizational design document based on current doctrine. It shows the basics of a structure and their wartime requirements. The Objective table of organization and equipment An updated form of the BTOE and it is a fully modern document and is up to date with current policies and initiatives. A Modification table of organization and equipment A document that modifies a Basic TOE in regard to a specific unit, used when a units needs are substantially different from the BTOE. The "Where Tomsk was Founded" marker at the Tomsk History Museum. The monastery at Gandzasar was also targeted by Soviet forces as a purported weapons storage location; a sympathetic Russian officer, however, declined to carry out the search. The regimental colours of the 5th Royal Inniskilling Dragoon Guards, displaying the battle honours awarded to the regiment. 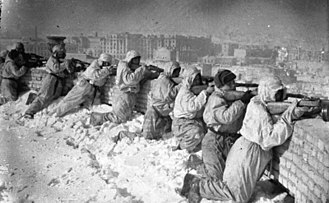 The fighters of the 95th Rifle Division on the day the Battle of Stalingrad ended. 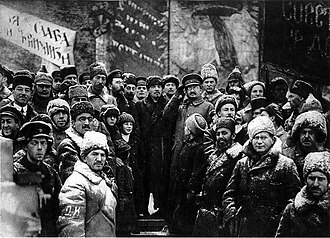 In the front row first from right Colonel Gorishnii, second (in a white sheepskin coat) – Colonel Vlasenko. An organization chart depicting the New Zealand Army's top level T/O as at 2007. The chart uses the NATO Military Symbols for Land Based Systems to depict the different kinds of units in the Army at this time.